What Does FSC Certified Paper Mean? What’s The Difference Between FSC Certified and Recycled Paper and Which is Better to Use? FSC stands for Forest Stewardship Council. They are a third party certification organization who assess those who manage the care of forests. They look at how those managing the care of a forest are complying with federal law and international agreements relating to the rights of indigenous peoples, enhancing the long-term social and economic well being of workers and surrounding communities, and conserving the biological diversity, water, soil and ecosystems surrounding the forest. The FSC also requires a management plan. It must describe the scale and intensity of logging and renewal operations as well as the long-term objectives and monitoring of the forest, making sure that what is cut down is being replanted. If all the criteria of the FSC are met by the management of the forest, then the forest will receive an FSC Certification. Paper made from wood taken from FSC certified trees is given the FSC Certification as well. FSC Certified paper does NOT have anything to do with the paper being recycled, but that it was derived from trees from a well managed forest. Recycled paper is made from either 100% discarded (post-consumer) paper, or a mix of post-consumer and pre-consumer paper (paper that is discarded during the paper-making process, but never gets used by consumers), or a mix of post-consumer and either FSC Certified or just regular, non certified paper. So which one is better? There is a lot of debate about this in the paper industry. Paper made directly from trees still requires the trees be cut down, (although they are replanted). Large tractors and logging machinery are used, adding pollution and noise to the surrounding environments, as well as chemicals and water waste used in the paper-making process. On the other hand, chemicals are still used in the making of recycled paper, because the fibers have to be broken down and de-inked (although most recycled papers no longer use toxic bleach in the de-inking process). I always use recycled paper. Although both types unfortunately use chemicals in the process, you are at least not adding to the landfills or harming ecosystems during the logging process. I encourage everyone to use recycled paper, even if it is only 30% or 50% recycled. If you choose to use non-recycled paper, make sure it is FSC Certified. At least you can feel confident that the wood was harvested with the utmost care and concern for the forest and its surrounding ecosystem. Prisma Graphic demonstrates respect for the planet, while maintaining its reputation as a high-quality commercial printer. Prisma Graphic, one of the Southwest’s leading privately owned commercial printers, becomes FSC certified to help protect the environment. “FSC certification was the next logical step for Prisma. Over the years, we have developed our own internal Sustainability Program. This program has focused on reducing our overall power consumption, recycling excess production materials, as well as properly treating and disposing of the chemicals used in the printing process,” states Robert Anderson, President. Despite the growth and popularity of the Internet as a marketing tool, the mailbox continues to be the preferred communication channel for information, promotions and announcements. According to a study by International Communications Research1, 70% of consumers prefer direct mail compared to 18% who prefer email. As consumer concern for the environment increases, so has sensitivity toward direct mail and its perceived negative impact. While direct mail accounts for only 2% of the country’s municipal waste, it is still a concern for businesses that use direct mail as a marketing strategy. So, what can marketers do to accommodate today’s consumers? Print Smart. 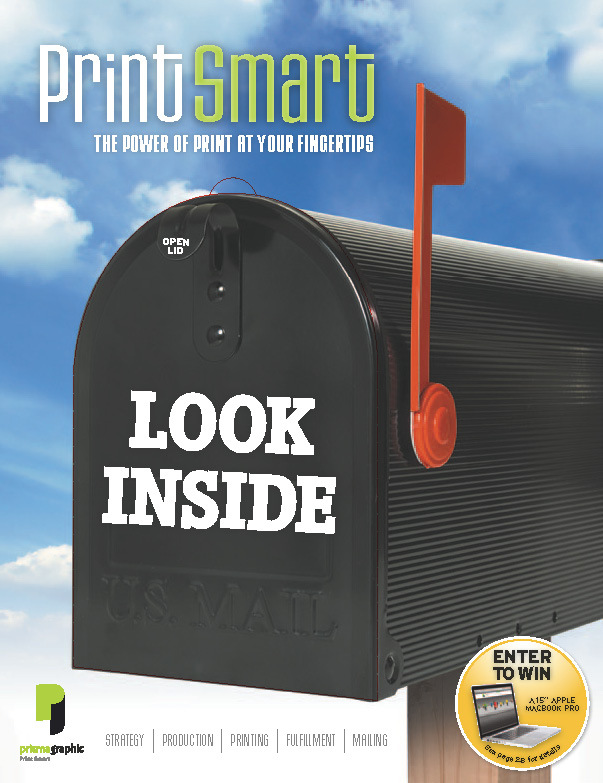 For Sherri May & Company, a mailing proponent that specializes in direct marketing, being green is the positive result of simply printing smart. “We’ve been the most successful when we focus on delivering the right message, to the right audience, at the right time, using the most energy and cost-efficient means possible. Green production is a win-win all the way around,” explains Sherri May. To address the growing concerns of the environment and the impact of direct mail, the Direct Marketing Association, Pitney Bowes and the United States Postal Service have all published practical steps to become more efficient in direct mail and thus more environmentally responsible. Each year almost 60 billion pieces of direct mail end up in landfills. By working with a partner who understands how to minimize undeliverable records and optimize the production process in general, you can save as much as 30% on each and every mailing. Incorporating USPS endorsed NCOAlink® software, Intelligent Mail® and OneCode ACSTM into the data process will ensure accuracy, helping to maximize ROI while maintaining good environmental stewardship. Besides positively positioning your company’s image, for little or no additional cost, using an FSC Certified paper helps reduce global warming, save forests, conserve water and lower emission of toxic pollutants. Moreover, using a recycled FSC Certified paper supports municipal recycling collection programs and diverts usable materials from incinerators and landfills. Generally speaking, the benefits of using a traditional recycled paper are more of a perception than a reality. Many countries continue to destroy rain forests for the hemp needed to produce the original papers used in the recycling process today. In fact, recycling traditional paper actually depletes more in fossil fuel and other non-renewable resources in the collection, fabrication and delivery than it saves for the environment. The FSC Certification demonstrates that your finished product was produced from start-to-finish, using sources and methods that promote responsible forest management worldwide. When possible, try to consolidate your message into fewer mailings. Instead of mailing monthly, consider mailing quarterly and augmenting the effort with opt-in, personalized phone and/or email communications. Combine multiple messages into a single envelope and always utilize the front and back of each insert. “Companies that are able to coordinate all their mailings through a single internal point person, do a great job of managing the customer mailbox. Customer perception can turn negative when they receive multiple mailings from the same company within a short period of time,” says Sherri May. These minor adjustments will stretch your marketing dollars and help to reduce your company’s impact on the environment. Making an impression is sometimes easier than most people think. Minor size adjustments, self-mailers versus envelope mailers and even using a pre-printed corporate mailing permit instead of stamps, can all extend the budget of a direct mail piece. This creative thinking not only improves efficiency, but also inherently applies eco-friendly practices. Implementing the use of a window envelope is a smart way to retain personalization, yet avoid the extra cost of match mailing. Also, by using poly-less window envelopes, especially on larger quantities, you can reduce production costs while making these envelopes easier for consumers to recycle. The increasing demand for a front-to-back eco-friendly process has made vegetable and soy-based inks more cost-effective than ever before. Today, these inks are very competitively priced against petroleum-based inks, and customers appreciate receiving printed pieces from those who demonstrate a commitment to the environment. Printing one project at a time is always more costly than printing multiple projects at once. Although that’s not always possible, a strategic approach to your next staggered, multiple-piece campaign could save your company thousands of dollars, while also reducing the manufacturing waste of the overall campaign. Employing these simple initiatives into your direct mail strategy can improve your company’s image, will be good for your budget and ultimately good for our planet. Print Smart is more than a philosophy for Sherri May & Company and Prisma Graphic. We all have a responsibility to our clients and to our shared environment. Plus, if we’re able to reduce a carbon footprint along the way… we all win! Contact Sherri May & Company today to discuss everything from data optimization, mailbox management and how to develop a results-driven direct mail campaign that positively impacts our environment. Call 602 547-7020 or visit www.sherrimayco.com . 2 The Truth About Green, February 2008, © Pitney Bowes Inc.
Over the years it became increasingly clear that print buyers were becoming tired and often frustrated managing multiple vendors in the direct mail process. This is especially true considering the everyday pressure to find ways of improving speed to market, while reducing costs at the same time. In response, Prisma Graphic hired a mailing expert, invested in the equipment and launched an in-house mailing department almost three years ago. This move quickly became an invaluable addition to our service offerings. We have been able to shorten turnaround times and reduce overall project costs for our clients. Today, our mailing department drops over 1.5 million pieces per month and continues to grow in output. your next direct mail project seamless, contact your a Sales Representative, or John Pisauro at 800 379-5777 or johnp@prismagraphic.com. Everyday at Prisma Graphic, we search for ways to step a little softer on the earth. From the inks we use and the paper suppliers we support, to the design of our 82,000 square foot facility and the company-wide recycling program, we are proud to say we have successfully implemented one of the most aggressive sustainability programs in our industry. Most of our success and efforts are thanks to our General Manager, Alan McAbee. His 29+ years of seasoned commercial printing experience and devotion to sustainability have benefited Prisma, as well as the green initiatives of some of our clients, Arizona State University in particular. Truth be told, Alan is always willing to discuss current trends and real-world sustainability applications with anyone who shares his passion. For more information about sustainability or to learn how Prisma can help with your efforts, please contact a Sales Representative, or Alan at 800 379-5777 or alanm@prismagraphic.com. Prisma Graphic’s Sustainability Program touches almost every aspect of the business. The FSC (Forest Stewardship Council) promotes good forest management that ensures sustainability, wildlife and stream preservation, biodiversity and legal logging practices. Paper is a very visible and identifiable arena where companies can demonstrate their commitment to environmental and social responsibility. Environmental organizations, paper buyers and consumers alike worked together to create this FSC Chain of Custody certification. Rather than just focusing on recycling, where chlorine and other harmful chemicals are needed, this Chain of Custody tracks wood fiber from its original point of harvest, all the way to the end consumer who ordered the printing and finishing of the paper. This certification establishes a credible system whereby the end client can be assured that the paper used on their project is linked directly back to the practice of sustainable forestry. Prisma Graphic’s Sustainability Program touches almost every aspect of the business. The majority of inks used are vegetable based, rather than the more volatile petroleum based. Their 82,000 sq. ft. building is cooled and heated with high efficiency HVAC and up-duct units. Even the lights in the front office are low-wattage, halogen bulbs.